Bit late in coming this week, but here’s today’s Sunday Sesh, brought to you by James Squire’s Jack of Spades Porter. I’ve ventured into the dark ales a bit over the last couple of weeks, and this one is now one of my favourites. Next time I’m at the Bottle-o I’ll be grabbing myself a carton. Little bit of history on the porter, as it’s a variety I haven’t come across until now. Apparently, it was one of the first “engineered” beers, being made from a combination of old (stale or soured) ale, a new ale and a weak one. It’s name came about because it was popular with transportation workers (porters) in the 1700s. Well, I’m not sure about that but it poured well with a creamy head and no real bubbles. It’s when you drink it that it really surprises. It’s a little tingly on your tongue, like sherbert, and very refreshing. It’s not as heavy as it looks and was surprisingly easy to drink. At $17.99 for a 6-pack, it’s another top-shelfer. After last weekend’s whinge-a-thon, I thought I’d go for something a little different this week and talk about writing. Nanowrimo to be exact. It’s been a while since I’ve spoken about Nano, but since there’s less than a month left before it begins, I figured I better get cracking. 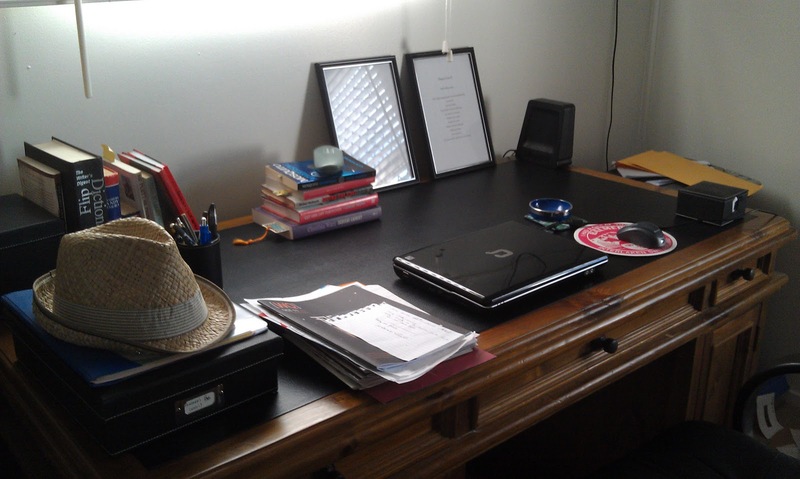 I decided, since my desk is where all the action will happen, I’d better give it a good clean. A little bit off track now, but still on writing – I ordered my Christmas present last week. Yes, you read right – I ordered my own Christmas present. Not because Wifey’s bad at buying presents (she’s quite good as a matter of fact), but because it’s a new release, and I figured I might be waiting a while to get it. What did I get? I hear you ask. A newly-released kindle e-reader from Amazon. Amazon have just released their latest suite of readers – a basic model for $US79, two touch-screens $US99 (wi-fi) and $US149 (3G), and a colour touch-screen model called the Fire for $US199. They also still have the previous models of the Kindle Keyboard available for $US99 (wi-fi) and $139 (3G) – the basic model is the only one currently available to us here in Aus, with the rest hopefully soon to follow. Why am I excited about this? Because Amazon have just increased my potential reader market. Cheaper e-readers means more people seeing what it’s all about, and that means more people looking for e-books. I’m not sure how long it will take to get my shiny new toy, but I am sure of one thing – since it’s a Christmas present, there is no way Wifey will let me have it until Christmas day, so you’ll have to wait (just like me) for me to give you my verdict. If you’ve been trying to decide whether or not to buy an e-reader, now is a good time to be getting one. As for me, there’s only one thing left to do – finish my damn book and get it onto Amazon. PS Notice I just wrote the whole Sunday Sesh without mentioning that Manly won the NRL grand final (until now) – this was the one time I hoped the Kiwis would triumph (sorry Nat). But, kudos to the Sea Eagles – they were the most consistent team through the finals series, if not the season, so it wasn’t an entirely surprising result.